Moving interstate can be a stressful experience – not only do you have to pack all your belongings up, but you also have to arrange to move them across the country. Fortunately, when you choose our removalists, Adelaide to Darwin moves are made easy. At Transcorp Removals & Storage, we aim to deliver a reliable removalist service that helps you to make your interstate move with minimal stress and hassle. Interstate Removals from Adelaide to Darwin – How Long Does It Take? If you’d like to learn more about our services, or if you’re ready to request a free quote, get in touch with Transcorp today. Call us now on 1300 466 838, or make a booking online to arrange removalists (Adelaide to Darwin). 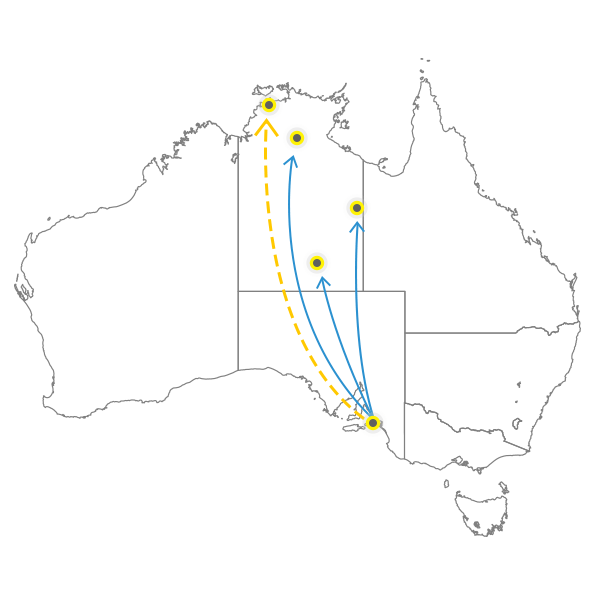 The approximate travel time from Adelaide to Darwin (either way) is 7 to 28 business days. If storage is required, please let us know. We can also provide our removalist services to all other areas between Adelaide and Darwin. Get in touch with us to learn more.